BOSTON – December 3, 2015 – Indie mobile game publisher Gameblyr and ZipZap Games, developers of the hit game Into the Circle, today announced that their follow-up title Sequence – Connecting Numbers is now available as a free download worldwide on the Apple App Store for iPhone, iPad, and iPod touch. In Sequence, players challenge themselves to solve sequential matching puzzles to complete and unlock new levels, while experiencing an ever-changing gameplay style and rapidly increasing skill-based problems to solve. • RELAX and play a visual and audio treat! Founded in 2013, Boston-based Gameblyr is a publisher of fine independent mobile games established on the principle that great independent games should not go overlooked. Committed to helping developers bring high quality mobile and cross-platform games to the market, Gameblyr offers a publishing model build to support indies to compete in today’s highly competitive environment. 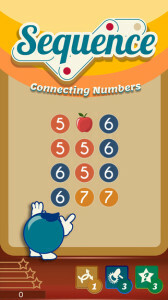 For more information, visit www.gameblyr.com. ZipZap Games is a small independent game development studio located in Hungary founded by an experienced team of developers. The studio released the hit title Into the Circle in May of 2015. ZipZap focuses on creating engaging and unique mobile experiences that are both challenging and original in design. ZipZap is currently working on bringing multiple titles to mobile next year and beyond.